Three top executives promoted Monday at Intel are among the leading candidates under consideration to replace Paul Otellini as the company’s CEO, according to sources familiar with the chip makers’ plans. 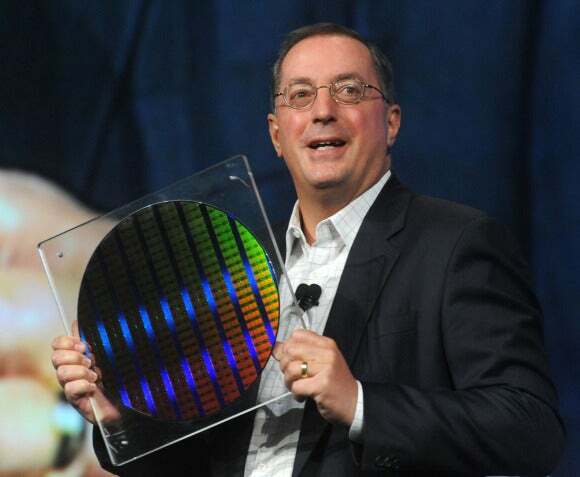 Otellini will retire in May as CEO and director after 40 years with the company, Intel said Monday. He spent eight of those years as CEO. Otellini’s successor will have the task of maintaining Intel’s top position in the slumping PC market while trying to dislodge ARM from the fast-growing mobile market. Chief Financial Officer Stacy Smith, Senior Vice President and General Manager of Software and Services Renee James and Senior Vice President and Chief Operating Officer Brian Krzanich were named executive vice presidents. The board of directors will look at both internal and external candidates as part of due diligence, but the executive promotions are not a coincidence, according to sources. Intel has never hired an external candidate to be CEO. Craig Barrett, Andy Grove and founders Gordon Moore and Robert Noyce came from within internal ranks. Otellini, now 62, succeeded Barrett in 2005, and his decision to step down came as a surprise, considering it was ahead of the mandatory retirement age of 65. Of the potential candidates, the ones most visible internally are Smith and Krzanich, said Nathan Brookwood, principal analyst at Insight 64. “Stacy has demonstrated good skills in understanding the company,” Brookwood said, comparing Smith to “a young Andy Bryant,” who is the company’s chairman. Smith is also a good communicator, he said. Krzanich has been recognized for Intel’s strong advances in manufacturing to meet Intel’s chip road map, Brookwood said. Manufacturing is key to Intel’s success as the company further dives into the mobile market, Brookwood said. “Intel’s a powerhouse, so much of what they do is tied to manufacturing. Krzanich is good at that and he’s good at communicating with external audiences,” Brookwood said. Intel’s past CEOs have been appointed at turning points in the company’s history and Krzanich has an edge in that regard because of the company’s strength in manufacturing, said Dean McCarron, principal analyst at Mercury Research. Otellini fixed a faltering chip road map and helped usher in the mobile era, but margins on chips are falling, McCarron said. Intel’s bread-and-butter may remain chips, but future profitability could be in effectively using the manufacturing assets to make chips for Intel and also other companies. High-capacity usage of the manufacturing assets could generate revenue for Intel. Intel could expand its foundry commitment and start taking big orders from third parties to make chips within the next two years, McCarron said. Intel already makes FPGAs (field-programmable gate arrays) in small volumes for third parties on its 22-nanometer manufacturing process, which is considered the industry’s most advanced. Another internal candidate who may be considered is Dadi Perlmutter, an executive vice president who runs the Intel Architecture Group, which is responsible for chip design. Outside candidates such as Pat Gelsinger, an ex-Intel executive and now CEO at VMware, may be considered for the role, but analysts said Gelsinger will likely not rejoin Intel. Otellini became Intel CEO just as the company was losing processor market share to rival Advanced Micro Devices and struggling with chip development. Otellini put in place a tick-tock strategy to update chips on a yearly basis, which stabilized the product research, development and chip manufacturing cycles. Otellini also diversified the company’s operations through acquisitions of companies such as Wind River and McAfee, which at the time was considered an unexpected move. Intel is now adapting McAfee’s products to add on-chip security features. Intel also acquired Fulcrum, Qlogic’s InfiniBand assets and Cray’s high-performance computing interconnect assets, with which the company is growing its networking, storage and server presence in data centers. Intel also bought wireless assets from Infineon, which will be used in Atom processors for smartphones and tablets. Intel’s acquisitions under Otellini were strategically sound and more relevant than acquisitions made by Intel under Barrett, said Insight 64’s Brookwood. Otellini also guided Intel through multiple antitrust cases and helped the company grow in the PC market. Apple shifted from the PowerPC processors to x86 chips in 2005 and 2006. But Otellini made his mistakes, among them failing to see the quick development of the mobile market and the company’s ultrabooks initiative has been a disappointment, analysts said. The PC market started slowing down due to alternative computing devices like tablets and smartphones and in an attempt to renew the PC market, Intel pushed ultrabooks as a new category of thin-and-light laptops with tablet features. “Otellini was a big cheerleader for ultrabooks, but ultrabooks aren’t looking as shiny as they did a year ago,” Brookwood said. Otellini to his credit speeded up Atom’s chip development to tackle ARM, but Intel has a long way to go before making an impact in tablets and smartphones, analysts said. ARM dominates smartphones and tablets with its low-power processors, while Intel has failed to catch up with its x86 processors, said Roger Kay, president of Endpoint Technologies Associates. “I think Paul committed the company to its own x86 architecture at a time when an alternative was taking root in the market,” Kay said.